Remember that all the citations added to your personal Mendeley library are also added to the database of citations that Mendeley shares with everyone. If you don't want a citation in your personal Mendeley library to be added to the crowd-sourced library (e.g., unpublished papers, personal manuscripts), check Unpublished work at the bottom of the document details. You can also add files by selecting file and then clicking add files or folder. Save online content directly to your Mendeley account with the Mendeley Web Importer. This tool scans your current browser window for references, and presents you with its findings. Google Chrome users can install our brand new browser plugin. Other browser users can use our 'bookmarklet' importer, which is added to the Favorites or Bookmarks menu. You can transfer your library from EndNote, Papers, Zotero, Refworks, Jabref and more. Use the Export option within the other software to extract your references to RIS, BibTeX, or EndNote XML file format. In Mendeley Desktop, click File > ‘Import’ and select the exported file to add its contents to your Mendeley library. 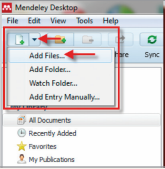 A Watch Folder allows you to automatically add new documents to your Mendeley library. Simply drop PDFs into the folder and Mendeley will import them automatically for you. Create a folder on your computer's desktop where you can add all the documents that you download. Select the 'Watch Folder' option from the add files dropdown menu on the main toolbar and browse to the folder that you created for the documents you're interested in. Mendeley will add each document to your library, scanning each one for useful details such as title, author and journal. Any subsequent documents added to the folder will automatically be added to Mendeley. A direct export function is available on other Elsevier products such as ScienceDrect and Scopus that allows you to export directly into Mendeley. When reading an article, click on the Export button and then choose "Save to Mendeley". Use File > ‘Add Entry Manually…’ to manually input the details of a reference. Select the appropriate document type and complete the fields to create a library entry using the details you provide. This can be used to create library entries for items that you do not hold in PDF form – such as books, articles and other types of media. Tip: You can use a DOI, PMID or ArXiv ID to look up the details of a reference. Paste the identifier into the appropriate field, and click on the magnifying glass. This will look up the item in the Mendeley Catalog and return the details provided by other Mendeley users. If the reference is completely new to Mendeley, the details will be retrieved directly from the appropriate identification service. 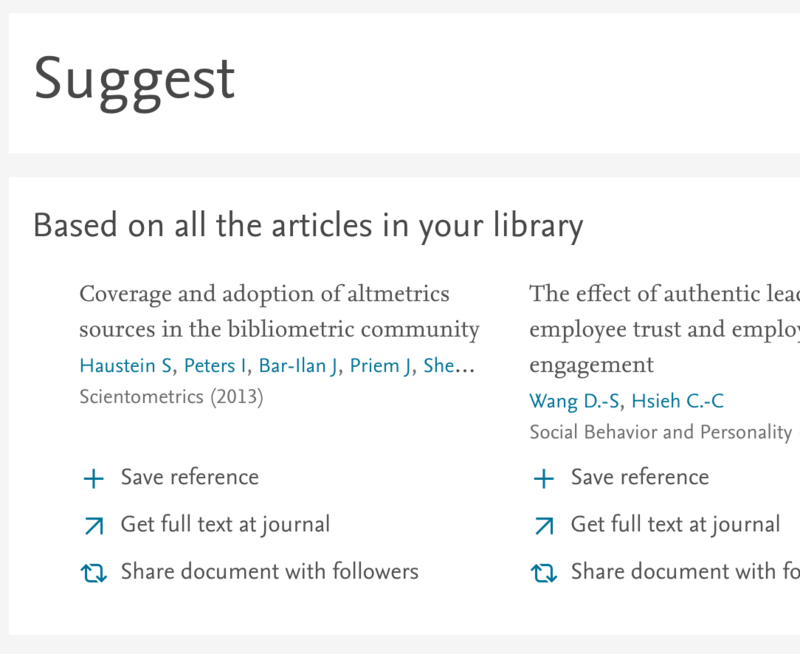 Mendeley Institutional Edition users can now try out "Mendeley Suggest" which suggests new papers based on your library. Try it today by clicking "Mendeley Suggest" which is located on the left panel below "Literature Search".